I’ve never met one fellow writer who enjoyed the marketing process as much as writing. Maybe they’re out there, but I haven’t met them. Most of us do it on one level or another. Some are pretty good at it. Some fight the process at every turn, saying they are a writer, not a sales person; they don’t have the knack, time, money or contacts. Fortunately/unfortunately, marketing it is a major part of being an author, because it attracts readers. And what are we without our readers? And don’t expect your publisher to do it for you. They have their own headaches. Unless you are a very major player in the publishing industry, it’s going to be up to you. So the sad/happy truth is, the more you blog, twitter, Facebook, email, do book readings, book signings, beat down the doors of independent bookstores, donate copies of your book to libraries, give-aways, drawings, etc. the more your books will sell. And sometimes you gotta spend money to make money. Painful stuff, but true. I just did that, and I would like to share the experience with my fellow writers…and anybody else to cares to read on. Bookbub is an email service that, among other things, notifies thousands of readers everyday about different books at a special price – often FREE – on Amazon.com. How they are tied to Amazon, I have no idea, other than the book is offered there. And you have to have a Kindle. Or a Kindle app. Or some such thing. Lots of authors buy into this triangulated service i.e. Amazon, Kindle, Bookbub. Maybe Bookbub does it with Barnes and Noble and the Nook. I have no idea. Anyway, the famous and not so famous, discount their books or offer them free on certain days. If you go and check out Bookbub’s website, you’ll see the breakdown of costs for various genres. I’m sure there are other email services similar to this one, but this is the one I did. In any event, I decided to plunge in, purchase a one-time email from Bookbub on the 1st day of the free 5-day offering through Amazon’s KDP*. 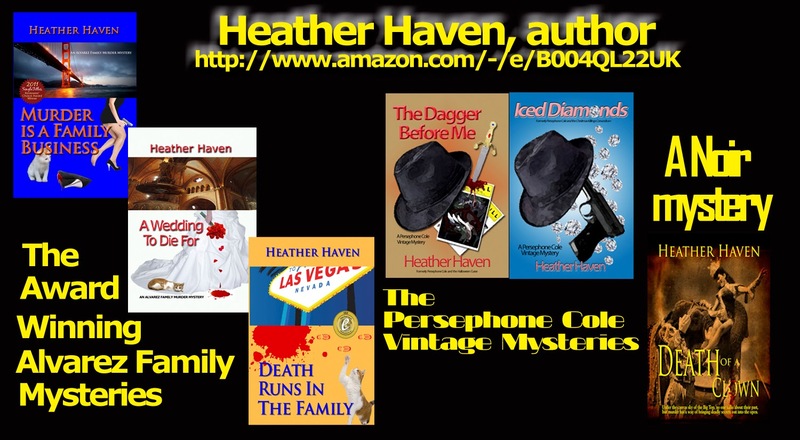 Yes, Book One of the Persephone Cole Vintage Mystery Series, The Dagger Before Me, was about to go public and in a big way. I was nervous. I was scared. The book had not done well in the past, mainly because I kept focusing on the Alvarez Mystery Series, and thereby neglecting my little 1940’s historical mysteries. As the Persephone ‘Percy’ Cole series is a holiday series – so far Halloween and Christmas – I thought this was the perfect timing. I hoped. I prayed. I believe I was right. Within the 5 free days, I got 36,424 downloads. If only 10% of the readers read what they downloaded, that means 3,600 new readers will be introduced to my work. The 2nd book of the series, Iced Diamonds, for which the reader must pay, has already received 42 downloads. The other 4 of my novels and my 1 short story, in eBook form, have picked up sales as well. When I did the math on what it would take me in sales to break even, I am almost there, in less than 3 days. So was this worth the expenditure, in my opinion? Yes. Would I do it again? Yes. But not for a little while. I need to continue the other pushes, and see how I do. Because, believe me, I don’t have that kind of money to throw around all the time. But, sometimes you gotta spend money to make money. * Exclusive sales rights belong to Amazon for a 90-day period. The book cannot be sold through any other vendor during that time. Any time. We're in this together. Hi, Heather. Interesting information. Thanks for sharing your results with using Bookbub. You're welcome! We writers need to stick together and when I see something that works, I like to pass it along. Today I looked at the sales figures and I've broken even on paying for the ad. It's up to me to try to keep the momentum going! Great post Heather and surely something to think about. I just never know when to shell out the cash! I'm headed to the website now! Thank you, Lin and Roseanne. Your continued support means the world to me! Continued success. Sounds like the ad really paid off. Suzanne, I write mysteries, so mine was at the top of the pay scale. I paid $245 for a one-time email. Depending on the genre you write, it can be less. Check it out. http://www.bookbub.com/advertise I'm sure it's done mathematically by how many readers of one genre or another is out there. But once again, while I can't do it very often, I intend to avail myself of this service again in the future. You betcha. May I ask how much you paid for this email with Bookbub? This is fascinating!! There are so many new things coming along for the writer to utilize!! Yes, it is still the hard work of doing the PR. Thanks for this new information.